Reigning world champion Fernando Alonso secured his first victory for McLaren as he claimed a pillar to post win in the Malaysian Grand Prix. Alonso, in his second race for the English team, led home Lewis Hamilton for a McLaren one-two to secure their first win since Japan in October 2005. Briton Hamilton, 22, held off a late charge from Ferrari's Kimi Raikkonen. Fourth place went to Nick Heidfeld in the BMW, followed by Felipe Massa in the second Ferrari in fifth, Giancarlo Fisichella in the Renault in sixth, Jarno Trulli in the Toyota in seventh and rookie Heikki Kovalainen taking his first point in eighth place. Rubens Barrichello started his Honda from the pitlane after an engine change. At the start Alonso passed polesitter Massa into the first corner, while Hamilton went from fourth on the grid to take second place. 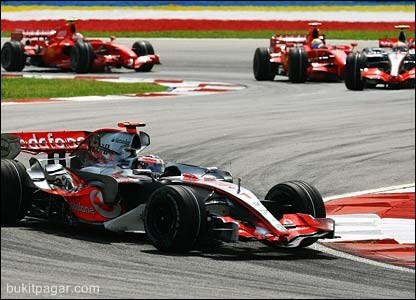 The order was Alonso, Hamilton, Massa, Raikkonen, Heidfeld, Kubica, Rosberg, Fisichella, Trulli and Webber in tenth. On lap 6 Massa attempted to pass Hamilton, but overshot the corner and had an off-track excursion, dropping behind Raikkonen and Heidfeld to slot into fifth place. David Coulthard retired his car in the pits with a brake problem from 11th position. On lap 43 Nico Rosberg retired with smoke coming from his car from sixth position. Alonso comes round the final turn and weaves left to right to claim his first win for McLaren. Hamilton hangs on to second by the skin of his teeth ahead of Raikkonen with Nick Heidfeld in fourth. Alonso comes over the radio and says: "It's been a tough weekend but thank you very much. We did it."